Montgomery Promenade is a 300,000 square foot regional shopping/entertainment development located in the heart of the true “Princeton” demographic. A carefully curated group of various retailers including local, regional and national tenants. This strategic selection of tenants will ensure that the shopping experience at Mongomery Promenade can draw consumers from a larger area than most retail centers in the area. for its consumers making it a destination for a unique dining experience. Anchored by a 60,000+ square foot entertainment center which can not be rivaled by anywhere else in the state. The Franks Theatre will consist of 11 state-of-the-art stadium seating theatre screens, 16 bowling lanes and a 5,000 square foot sports bar with televisions for endless sports viewing. family destination for all seasons. Montgomery Promenade is a 300,000 square foot regional shopping/entertainment development located in the heart of the true “Princeton” demographic, which is widely recognized to be among the wealthiest and most educated regions in the nation. While this trade area is signicant, with almost 200,000 people, it is vastly underserved in almost every facet of shopping, dining and entertainment experiences. Montgomery Promenade is intended to satisfy these needs and is close enough to Princeton University and convenient enough to the regions to the south to attract a customer that would otherwise prefer to avoid the perils of Route 1. Most important, Montgomery Promenade will easily accommodate the needs of customers to the north, west and east, which are equally as wealthy and underserved but completely out of reach of Route 1. The convenience of this regional shopping and entertainment destination is unmatched as Montgomery Promenade is strategically positioned at the intersection of the region’s prominent corridors Route 206 (north/south) and Route 518 (east/west). View the short video of the Montgomery Promenade project. Experience the 3D model and explore the 95,000 square feet of Shopping. 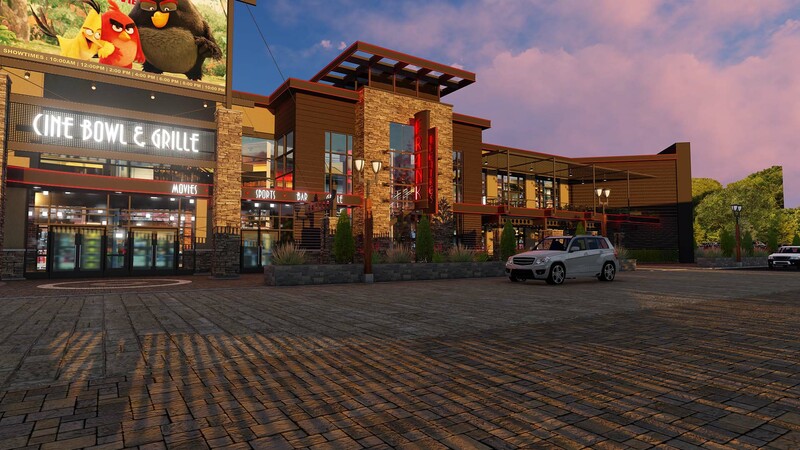 See the 30,000 square feet of Premium Dining that will be anchored by 4 full service high end restaurants. View the 60,000 square feet of entertainment and experience the 1 acre of premium green space that will host concerts, farmers markets and ice skating.